Once a month on a Friday we’ll Bal up the Jazz Factory! Great DJs and sometimes a live band! Entrance 5 € Cash Only. Some small snacks and drinks are available but feel free to bring your own! Odotettu Salakapakka avaa ovensa tänäkin vuonna! Syyskuisena iltana historiallisessa Fennia Salongissa uhmataan kieltolakia, tanssitaan villin swing-musiikin ja paheellisen bluesin tahtiin, hapsumekot heiluvat ja kahvikupeissa kilistellään kovaa teetä. Maagisen tunnelman takaavat upeat DJ:t ja esiintyjät, kuten absoluuttisen hurmaava ja svengaava SoulSisters trio sekä Jazz Factoryn Midnight Follies! Merkitkää päivä kalenteriinne, sillä näistä juhlista puhutaan vielä pitkään! Pukeudu ihanaan 20-luvun tyyliin ja tule mukaan juhliin Casino Helsingin Fennia Salonkiin lauantaina 22.9.2018 klo 20.00–03.30. That annual, infamous, Speakesy will open its doors again this year! On a late September evening, it’s time to put your glad rags on and gather up in Fennia Salon! The legendary Speakeasy party brings together all the thirsty partygoers, gangsters and flappers. The dance floor will be packed and there will be some great DJs and magical performances, such as the breathtaking and swinging SoulSisters trio and Jazz Factory’s very own Midnight Follies! Save the date in your calendar. You don’t want to miss this one! Dress up in the exquisite 20’s style and join the decadence of the prohibition era at Fennia Salon in Casino Helsinki on Saturday 22.9.2018 at 20.00–03.30. Sukella aikamatkalle 1900-luvun alun hämyisiin salakapakkatunnelmiin esityksistä nauttien, soolo- ja paritanssitunneille osallistuen, vanhaa bluesia ja jazzia kuunnellen ja aamun pikkutunneille saakka tanssien. Blues & Jazz Cornerin koko festivaalin ajan jatkuvan ohjelman tarjoaa Jazz Factory. Kaikki tanssitunnit soveltuvat ensikertalaisille lajissa. It’s the early thirties, the Great Depression causes turmoil, Prohibition is enforced ever stronger, and the streets grow restless as Capone and his gansters rule the city of Chicago. But, in Fennia Salon, the music plays, drinks flow, and the shows are glamorous! Prepare to be mesmerised by fantastic live musicians, unforgettable dance shows, and a glamorous, magical atmosphere. The dance floor is open for everyone all night long. Here you can forget about your woes and dance the night away to the best jazz in town! So get out your glad-rags, and join the other hepcats and make it a night you will remember! 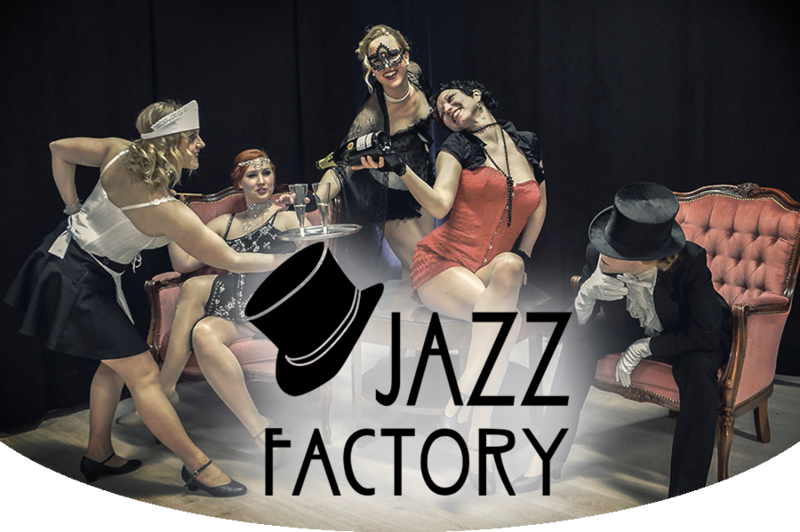 After the successes of the Charleston & Swing Night in 2015 and the Paris Night in 2016 at the Helsinki Casino, the Jazz Factory presents ’Chicago -Swing & Blues Night’. Welcome! Tickets 25 euros. Get yours here. This event is organised at Helsinki Casino and can be accessed only with a valid identification and a minimum of 18 years of age. Once again, it’s time to put your glad rags on and gather up in Fennia Salon! The legendary Speakeasy party brings together all the thirsty partygoers, gangsters and flappers. The dance floor will be packed and there will be some great DJs and magical performances, such as the breathtaking and swinging SoulSisters trio, the Blues royals Robbie Hill & Emilia Sisco, and Jazz Factory’s Midnight Follies! Save the date in your calendar. You don’t want to miss this one! Dress up in the exquisite 20’s style and join the decadence of the prohibition era at Fennia Salon in Casino Helsinki on Saturday 8.4.2017 at 21–04. Presale 20 euros, 25 euros at the door. or at Casino Helsinki (no service fee). Palladium nights’ Paris night: Imagine Paris in the 20’s, with it’s Moulin Rouge cabaret shows and Speak Easies filled with crazy charleston, fast swing, misty blues and all that jazz! 25€ / From the door! Organized in collaboration with Jazz Factory and Rock’n’Roll Dance Club Comets ry.